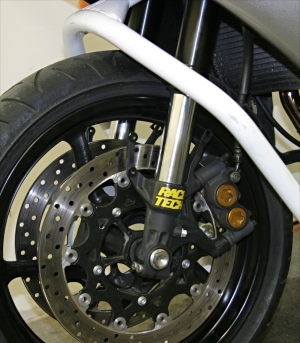 One of the most important aspects of riding a modern sportbike is suspension set-up. If you get it right it can turn an unruly beast into a tame kitty cat, but get it wrong and you may end up getting bitten. After riding my 2004 R1 at a few track days, I decided that, as good as it was right out of the box, it still needed a great deal of set-up work to be perfect on the street or at a track day. After I had a chance to ride an R1 that had been set up by the guys at Race Tech (located in Corona, California), I immediatley realized how far off my set-up really was. After a few phone calls and a little wrenching, my stock forks and shock were ready for Race Tech to work their magic with a complete revalve and respring. When I arrived at their shop, I was greeted by Randy Acevedo, Race Tech’s track support technician. He and I spoke about my riding preferences and ability. He then wrote some notes about my height and weight to aid him in spring rate selection. He then assured me he would be able to match my suspension to my needs. When I received my re-worked suspension, it didn’t look much different from before, with one exception: Race Tech had installed a new pre-load adjuster on the rear shock. 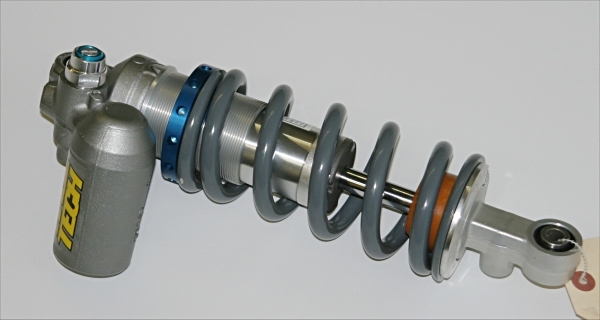 The stock adjuster is a “ramp style” seven position adjuster, while the Race Tech unit is an infinitely adjustable type. After re-installing the shock and fork assembly, I took the R1 straight to California Speedway for a track day. I took the bike out in the first session without touching any of the clickers, leaving the settings exactly how they had arrived from Race Tech. Man, what a difference – the R1 that I had raved about got even better! The first thing I noticed was the amount of feedback I was now receiving from both ends of the R1. The forks no longer dove to the bottom of their stroke when I got on the brakes, and the rear end was a lot more settled on corner entry. After my first session was over, I went to the Race Tech truck to thank Randy for the great job he had done. When I arrived at their truck, before I could say a word, Randy grabbed my bike and set it up to take measurements. I had been so excited, I forgot that we still needed to set the sag to my weight. After a few minutes with a tape and a note pad, Randy had me measured, set-up and ready to go. I went back out onto the track and immediately noticed an even bigger improvement: better balance, better feel, less rider fatigue, and a bigger smile on my face. After enjoying Race Tech’s handy work on the track, I got a chance to do a little play riding on the street. Everything I noticed on the track was even more noticable on the street – the R1 is easier and more fun to ride. After a few days of thinking about how much of an improvement the new suspension was over the stock set-up, I began to realize that whether for the track or street, the suspension should be on top of everyone’s list of modifications to be done on any motorcycle. I see many people who buy new sportbikes spend $1000+ on a full exhaust system, when in reality they can’t use all the power their bike has in stock form (particularly with a 1000). Their money would be better spent on something that makes their bike easier to ride, and enhances their ability to use its power to the fullest. Reworking the suspension to fit your size and riding style is a modification that you really get your money’s worth from, and Race Tech should be on your short list when it’s time to do it. The total for all the modifications to my suspension (revalve front and rear, new springs front and rear, and infinitely adjustable preload collar for rear shock) came out to $927.46, although a lighter rider (I weigh 230 lbs) might be able to save money by reusing the stock springs (see cost breakdown below). You can contact Race Tech at (951)279-6655 or visit their website at www.racetech.com.